Finigan's Gourmet Fish & Chips has a reputation with the locals who know where to buy a sizzling hot meal of fresh barra and chips. Conveniently located a block from the Nightcliff Jetty with it's cool sea breeze, Finigan's provides the quality fish, salads and chips for a perfect evening. The worst attitude and disgusting fish ever ! The people in this joint have the worst attitude ever! and I thought ok maybe the fish is a bit better but no ! It's a piece of rubber ! I have had fish & chips from this place a few times but disappointed most of the time. At least don't try the battered fish, ask for crumbed if you ever have to go here. 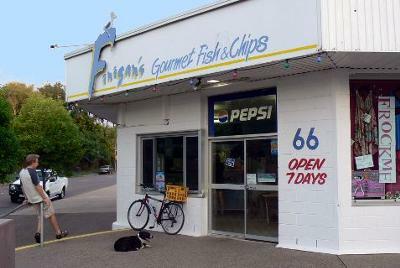 I love the pic of the dog waiting for his fish and chips! !